There's one thing that President Obama and Canadian Prime Minister,Justin Trudeau can't agree on, they unanimously declared Thursday during a joint press conference: Hockey. Nope, nope, nope. On Thursday morning, President Obama welcomed Prime Minister Trudeau and his family to the U.S. in a speech on the White House lawn. 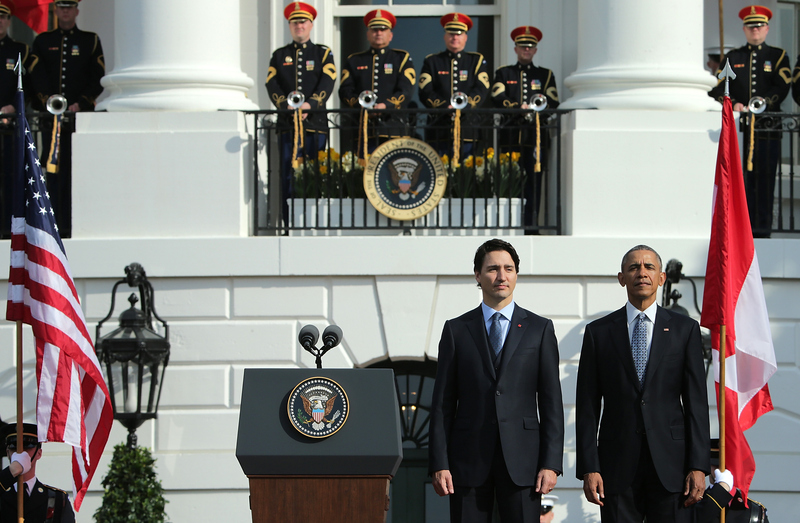 Trudeau is the first Canadian prime minister to make an official visit to the U.S. in almost 20 years. While the President is nearing the end of his time in office, Prime Minister Trudeau began his term in November 2015. The President's welcome address was a lighthearted event. He joked that Trudeau is lucky to be making his first trip to the U.S. during a spell of beautiful weather — Obama's first official visit to Canada took him to the frigid capital city, Ottawa, in February. The President also remarked that he and the Canadian prime minister do not always agree oneverything,joking that the two world leaders will always disagree on which country's beer is best, and whether or not the U.S. or Canada is better at hockey. At the mention of the hokey contention, the Prime Minister, standing next to the President, shook his finger and responded, "Don't get me started." Obama went on to remind Trudeau that the Stanley Cup is currently housed in his hometown since the Chicago Blackhawks won the NHL championship in 2015. Justin Trudeau's father, Pierre Trudeau, also served as Canada's prime minister. In a more serious tone, President Obama mentioned the current Prime Minister's father and his first visit to the U.S. forty years ago. The President stated that during his inaugural White House visit, Pierre Trudeau referred to the U.S. as "Canada's best friend and ally." President Obama went on to praise 44-year-old Justin Trudeau for his success in office so far, and commented that he had never seen so many Americans this excited by the visit of a Canadian prime minister. Since they disagree on little other than hockey and beer, Obama and Trudeau are sure have successful meetings during the Prime Minister's visit. In particular, the two leaders are expected to announce new joint measures between the U.S. and Canada addressing climate change — an issue Obama and Canada's former prime minister, Stephen Harper, did not agree on. The Obamas will host a state dinner in the East Room at the White House on Thursday night to celebrate the Canadian first family. The New York Times reports that the state dinner held in honor of Canada will include "Alaskan halibut 'casseroles,' roasted apricot galette, baby lamb chops with Yukon Gold potato dauphinoise and a maple pecan cake with cocoa nib wafer and butterscotch swirl ice cream." Hopefully, no one will bring up hockey over dinner!